The Perceptions of Pregnancy blog, like the Researchers’ Network, aims to reach beyond boundaries and borders, and to facilitate an international and interdisciplinary conversation on pregnancy and its associated bodily and emotional experiences from the medieval to the modern. Today’s post from Isabel Davis introduces us to a new project that examines conception in the past and the present. Those undergoing IVF treatment look modernity in the face. Watching a cell fertilise and an embryo develop in a petri-dish necessarily inspires awe in modern science. Read, for example, this moving account of embryo transfer by New Zealand blogger Little Red Hen. At the same time as marvelling at reproductive technology, she spares a thought for the people of the past, who lived without these assistive technologies; in spite of her own struggles it makes her ‘feel lucky’. For those who don’t have to turn to IVF there are also wonderful technologies: pregnancy tests and ovulation kits allow women to monitor and collect data about their bodies. The internet gives them access to professional medical advice on how to achieve pregnancy. These technologies are relatively recent, unavailable for some of our mothers and certainly not our grandmothers. And all the time there is more news about what may be possible in the future. Yet, there are some things that science cannot help people with. In Little Red Hen’s account of her embryo transfer, the clear light of a clinic, the transparency of a petri-dish, the magnified and back-lit image on a TV monitor is exchanged for complete darkness; she watches as her embryo ‘floated gracefully down in the blackness – a glowing white dot that finally nestled into the bottom and disappeared from view’. For those trying to conceive in the old-fashioned way, the same is true: there is no vantage point from which fertilisation and implantation can be seen. And then there is a wait. Science cannot help us to wait. Waiting to find out if you’re pregnant can be hard, whatever you hope for the outcome. Some women and their partners, who would like to be parents, are experiencing this wait every month, for month on month and year on year, perhaps forever. In the window of time before a pregnancy test can be done, people today inhabit the speculative space our ancestors occupied before testing was a possibility. Conceiving Histories is a new project, funded by Birkbeck College and the Wellcome Trust, researching the history of this space, the time before diagnosis, either of pregnancy or infertility. Of course there are historians – like Cathy McClive, Catherine Rider, Sara Read, Jesse Olszynko-Gryn, Jennifer Evans and many many others (sorry if I’ve missed you out) – working in different historical periods to draw out parts of this story. But, as yet, there is no general history, for a non-academic audience, of not being pregnant (yet). Conceiving Histories is a collaboration between me, an academic literary historian, and practice-led visual artist, Anna Burel. Together we are looking at how early or pre-pregnancy was described, negotiated and experienced in the past and how this historical knowledge might be used to contribute to debates and questions about becoming a parent, or not, today. The project is building up case studies, from different periods between the Middle Ages and the late 1970s, when the first home pregnancy tests first became available. The case studies concern hidden, misdiagnosed, imagined, feigned and hysterical pregnancies, as well as technologies for charting the menstrual cycle and diagnosing pregnancy. We are particularly interested in the way that fantasy and magical thinking floods into the vacuum created by a lack of objective knowledge today, as well as in the past. Currently, to give one example, we are working on the Gardner peerage dispute from 1825-6. The case documents a concealed pregnancy, or at least a pregnancy that came to be concealed once Mrs Gardner recognized that she could not give birth in time for the baby to be unequivocally accepted as her husband’s child. A number of medical deponents (eighteen midwives, one female and seventeen male) were called to testify to the length of human gestation, in an effort to prove or disprove the child’s legitimacy. The more evidence that was brought, the less clear the matter became. Each deponent dated conception from a different sign or symptom. Each had a different attitude to the medical authorities, from Pliny to William Hunter. Each put a different weight on women’s accounts of their own experiences. For some, there was little advance on the knowledge of the ancient world, let alone that of the previous generation. Whilst I am investigating the peerage case and divorce proceedings which prefaced it, Anna has been imagining this material in a much more visual way. Using research into fashions in the 1820s and 30s, she is articulating the anxieties expressed in and around this case in a new body of artwork, of which the picture illustrating this blog post is one example. 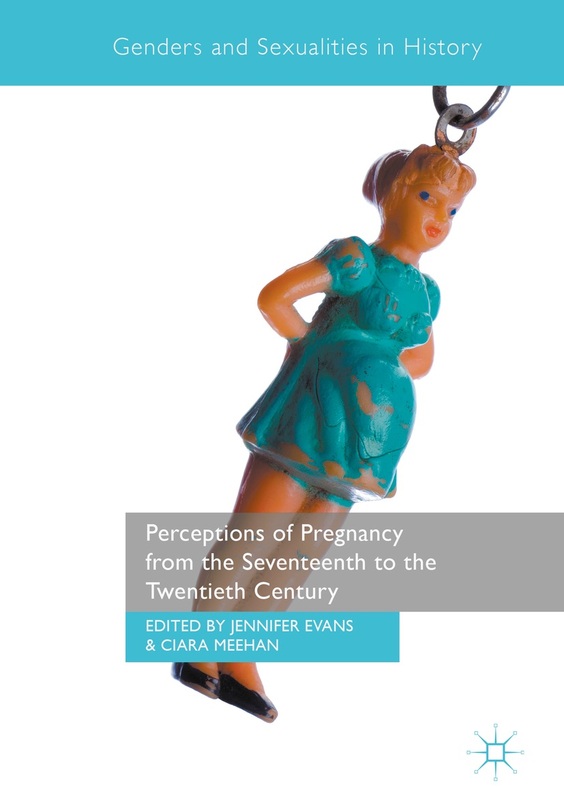 The early nineteenth century was a hyper-modern age, an age of enormous scientific and technological strides, and yet, on the subject of pregnancy diagnosis, people described and experienced a troubling persistence of the past. The strange encounter with the past in the present is at the heart of the Conceiving Histories project. Isabel Davis is an academic in the Department of English and Humanities, Birkbeck, University of London. She has published widely on the topics of medieval gender, household and the body. Parliamentary archives HL/PO/JO/10/8/744 and HL/PO/JO/10/8/711. Much of this is printed, although abridged, in Denis Le Marchant, Report of the Proceedings of the House of Lords on the Claims to the Barony of Gardner (London: Butterworth, 1828). This entry was posted in Blog Posts, Past Posts, Uncategorized and tagged concealed pregnancy, fertility, history, Parenthood, pregnancy. Bookmark the permalink.